If you can play simple chord progressions with 6th and 5th string root bar chords this lesson shows you how to embellish them by linking the chords with some bass runs. Adding runs like these gives your rhythm guitar playing extra class and sounds great, especially if you're playing by yourself with no bass player. In this lesson we'll take a simple 8 bar I-IV-V chord progression and add some bass runs to each chord change. Let's start by taking a look at the chord progression in the key of G major, shown below. I've deliberately shown a very simple rhythm pattern of one strum per beat to make things easy when the bass runs are added. Of course, you can try things out with more sophisticated rhythms if you wish. In the second version of the progression shown below bass runs are added to each chord change. On the changes from G to C, and from C back to G, I've added a run of notes from the G minor pentatonic scale. The run at the end of bar 2 targets the G note at the 5th fret 4th string. This note is also the 5th of the C chord and leads nicely into the root C note with a V-I movement. In the fourth bar play the slide down from 3rd to 1st fret with your forefinger. Move this finger up to the 6th string for the b7 at the 1st fret and then move the same finger up to the 3rd fret ready to play the G chord again. In the sixth bar the G major pentatonic scale is used to create the bass run up to the V chord. Play the slide on the 6th string with your third finger, this will move your hand up to the 5th fret ready for the rest of the run and the D chord. Follow the descending run in bar eight with the root G note on the first beat of the next bar as you repeat the pattern. Here are the G minor pentatonic and G major pentatonic scales on the bass strings that are used for these runs. You can use different combinations of these notes to create more runs of your own. In the coming days I'll be showing you some more options to create bass runs with these, and other, scales. At the end of the series I'll gather up all the examples and lessons into a free PDF report you can download and print. If you don't want to miss it be sure to sign up to get updates delivered free by email or to your RSS reader. 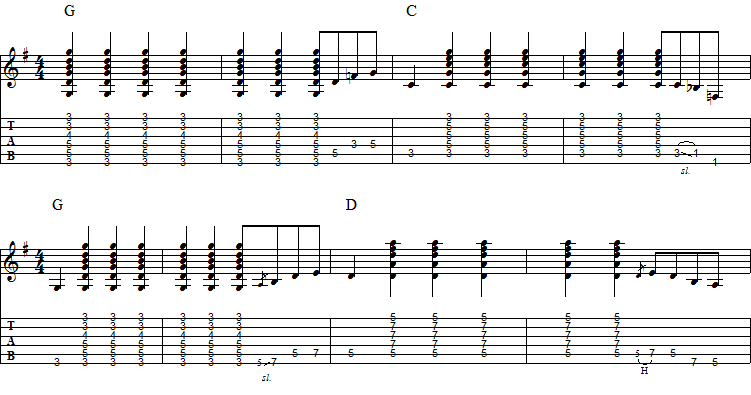 Update: Bass Runs For Guitar Bar Chord Progressions Part 2 is now available.